Grand Champion Beef Feeder shown by Olivia Harris; Purchased by Burke Farms. Reserve Champion Beef Feeder shown by Mackenzie Newell; Purchased by Reed and Baur Insurance and Ohio Valley Plumbing. Grand Champion Beef Steer shown by Jess Parker; Purchased by Parker Corporation. Reserve Champion Beef Steer shown by Trenton Morrissey; Purchased by Drs. Jeremy and Martha Buckley, Buckley Group Engineering and Surveying and Precision Fabrication. Grand Champion Dairy Feeder shown by Allison Barber; Purchased by Hendrix Heating and Cooling and Hendrix Contracting. Reserve Champion Dairy Feeder shown by Raegan Jones; Purchased by State Representative Jay Edwards. Grand Champion Dairy Steer shown by Kaylin Barber; Purchased by Mark Porter Chevrolet. Reserve Champion Dairy Steer shown by Grace Butcher; Purchased by RVC Architects. Grand Champion Goat shown by Jessica Parker; Purchased by Mark Porter Chevrolet. Reserve Champion Goat shown by Jennifer Parker; Purchased by Parkersburg Home Surplus and Liquidation. Grand Champion Hog shown by Jenna Jordan; Purchased by Stanley Logging and Meigs County Prosecutor James K. Stanley. Reserve Champion Hog shown by Jaycie Jordan; Purchased by J&M Auto Sales. Grand Champion Lamb shown by Auston Colburn; Purchased by Dr. Meghan Haynes of Holzer Athens. Reserve Champion Lamb shown by Wyatt Watson; Purchased by Pool Masters of Vienna. Grand Champion Poultry shown by Austin Rice; Purchased by Dettwiller Lumber and Peoples Bank. Reserve Champion Poultry shown by Cooper Schagel; Purchased by Kinsale Corporation. Grand Champion Rabbit shown by Brycen Rowe; Purchased by Ridenour Gas Service. Reserve Champion Rabbit shown by Hanna Bottomley; Purchased by Ridenour Gas Service. 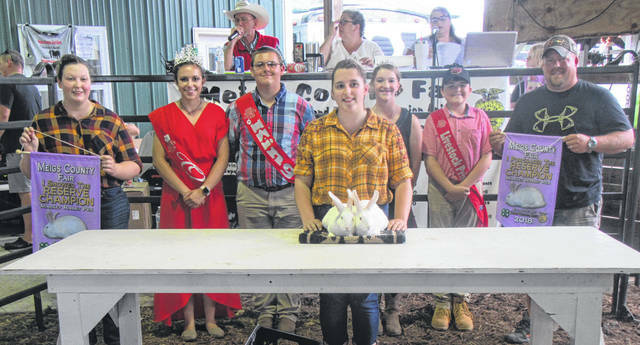 ROCKSPRINGS — It is not just buying an animal, it’s investing in the youth, explained Auctioneer Dean L. Blackburn before Saturday’s Meigs County Fair Livestock Sale. Buyers did just that, spending thousands on animals from cattle to chickens, hogs, rabbits, lambs and goats. In addition to the winning bidders, others “bumped” the purchase prices, giving the youth more for their hard work on their projects. Olivia Harris (Grand Champion), $2,150, Burke Farms; Mackenzie Newell (Reserve Champion), $2,400, Reed and Baur Insurance and Ohio Valley Plumbing; Lucas Finlaw, $1,200, Holzer Health System Meigs; McKayla Nelson, $1,450, Reed and Baur Insurance and Ohio Valley Plumbing; Preston Ervin, $1,500 Shelly Material; Allison Hatfield, $2,300, Jackson Ag Service; Owen Johnson, $1,300, Holzer Health System Meigs; Alexis Ervin, $1,700, Farmers Bank; Kylie Gheen, $1,700, Mark Porter AutoPlex; Brayden Ervin, $1,700, Pomery Express Care or Pleasant Valley Hospital (PVH); Samuel Bauerbach, $1,700, Heritage Co-Op; Ethan Mullen, $1,800, RVC Architects and Pat Mullen Construction; Dalton Ervin, $1,550, Athens Livestock and Ervin Family Farms; Ryan Parker, $1,400, Peoples Bank and Roush Brothers; Conner Ervin, $1,700, Holzer Health System Meigs; Madison Johnson, $1,350, Mark Porter Chevrolet; McKenzie Long, $1,550, Ridenour Gas Service; Cassidy Bailey, $1,450, Home National Bank; Austin Rose, $1,500, Farmers Bank; Ryan Ross, $1,500, Heritage Co-Op; Megan Ross, $1,300, Precision Fabrication. Allison Barber (Grand Champion), $1,500, Hendrix Heating and Cooling and Hendrix Contracting; Raegan Jones (Reserve Champion), $1,500, State Representative Jay Edwards; Caelin Seth, $1,000, White’s Sanitation. Jessica Parker (Grand Champion), $1,350, Mark Porter Chevrolet; Jennifer Parker (Reserve Champion), $1,100, Parkersburg Home Surplus and Liquidation; Alexa Ingels, $1,600, Gavin Plant; Makenzie Robertson, $1,500, RC Construction Company; Alivia Ord, $900, Farmers Bank; Becca Pullins, $1,700, Ridenour Gas Service; India Morris, $750, Bob’s Market; Jeremiah Mohler, $600, Dettwiller Lumber; Cameron Hall, $550, Drs. Jeremy and Martha Buckley; Drake Hall, $500, Mark Porter Ford of Jackson; Arielle Beeler, $650, Mark Porter AutoPlex; Rhiannon Morris, $600, Karr Contracting; MaKenna Rankin, $900, Ridenour Gas Service; Dylan Chevalier, $900, Baum’s TP One Stop; Bradley Dillon, $1,000, Norris Northup Dodge; Avary Mugrage, $850, Farmers Bank; Bryant Mohler, $500, Irvines Camper Sales; Alex Pierce, $800, Ohio Valley Bank; Kyra Zuspan, $900, Pomeroy Express Care of PVH; Maylee Barringer, $750, Save A Lot of Pomeroy; Avery King, $800, Home National Bank; Woody Will, $650, Mark Porter Chevrolet; Lydyah Barringer, $700, Bob’s Market; Ayden Barringer, $650, Birchfield Funeral Home; Sydneyahna Card, $900, Pomeroy Express Care of PVH; Ben Bailey, $700, Holzer Health System Meigs; Morgan Haines, $700, Pomeroy Express Care of PVH; Bella Mugrage, $650, Ridenour Gas Service. Auston Colburn (Grand Champion), $2,500, Dr. Meghan Haynes of Holzer Athens; Wyatt Watson (Reserve Champion), $2,000, Pool Masters of Vienna; Maci Hood, $850, McDonalds of Pomeroy and Ravenswood; Braden Watson, $800, Baum Lumber Company; Lincoln Thomas, $1,900, Nova Rubber; McKenzy Burnem, $750, Shelly Material; Matthew Werry, $1,900, Ewing-Schwarzel Funeral Home; Laikyn Davis, $1,300, Ice Racing; Jacynda Glover, $1,000, J&M Auto Sales; Matthew Parry, $950, Home National Bank; Amy Griffin, $850, Irvines Camper Sales; Michael Kesterson, $1,450, DJM Hardwoods; Lauren Thorson, $900, White-Schwarzel Funeral Home; Caroline Roush, $900, Farmers Bank; Luke Enright, $1,100, H&L Hoof Trimming. Kaylin Butcher (Grand Champion), $2,500, Mark Porter Chevrolet; Grace Butcher (Reserve Champion), $1,700, RVC Architects. Jenna Jordan (Grand Champion), $3,150, Stanley Logging and Prosecutor James K. Stanley; Jaycie Jordan (Reserve Champion), $2,100, J&M Auto Sales; Jacob Jordan, $1,650, Shade River Ag; Bruce Hawley, $1,300, McDonalds; Erica Durst, $1,300, Constellium Rolled Products; Trinity Wood, $1,200, Nova Rubber; Steven Fitzgerald, $1,100, Nova Rubber; Kori Robie, $1,150, Hupp Landscaping, TJohnson Contracting, Reed and Baur Insurance, and Ohio Valley Plumbing (donated to Make A Wish); Courtney Fitzgerald, $1,000, Skyline Bowling Center; Roseanna Butcher, $900, McDonalds; Brady Colburn, $1,000, Pomeroy Express Care of PVH; Brandon Oldaker, $1,500, Buckley Group Engineering and Surveying; Whitney Durst, $1,250, D.V. Weber Construction; Layne Caldwell, $1,350, Holzer Health System Meigs; Kathryn Ryan, $2,000, J&L Construction; Ashton Monroe, $1,300, Rose’s Excavating; Autumn Jones, $1,200, Wild Horse Cafe; Chloe Rizer, $1,300, AEP Mountaineer Plant; Shelbe Cochran, $1,400, Mark Porter Chrysler, Dodge, Jeep, Ram; Elizabeth Collins, $1,600, Parkersburg Home Surplus and Liquidation; Bradley Hamm, $1,300, AEP Mountaineer Plant; Garrett Wolfe, $1,700, Home National Bank (donated to St. Jude Trail Ride); Logan Caldwell, $1,400, White-Schwarzel Funeral Home; Simon Spires, $1,400, Farmers Bank (donated to St. Jude Trail Ride); Brandon Colburn, $1,200, Save A Lot of Pomeroy; Colton Hamm, $1,600, Pool Masters of Vienna; Coltin Parker, $1,350, Dr. Melanie Weese Optometry; William Oldaker, $1,800, AEP Mountaineer Plant; Kaden Robinson, $1,750, Rose’s Excavating; Robert Butcher, $1,250, Ridenour Gas Service; Malachi Smith, $1,200, Porter’s Pumpkin Patch and Webb Company Trucking; Ashton Jude, $1,750, Moore’s Petrolium; Brad Hawk, $1,600, Gavin Plant; Micaiah Smith, $1,400, Middleport Jail and Meigs County Sheriff; Kaitlyn Hawk, $1,800, McGinnis Inc.; Brayden Robinson, $1,800, Norris Northup Dodge. Jess Parker (Grand Champion), $3,100, Parker Corporation; Trenton Morrissey (Reserve Champion), $3,400, Drs. Jeremy and Martha Buckley, Buckley Group Engineering and Surveying, and Precision Fabrication; Faith Bauerbach, $2,500, Parker Corporation; Rylee Lisle, $2,400, I-77 Auto Group; Abigail Bauerbach, $2,300, Parker Corporation; Mitchel Evans, $2,800, Rose’s Excavating; Trevor Morrissey, $2,300, Ohio Valley Bank; Katelynn Chevalier, $2,500, JayMar; Zachary Williams, $2,800, Home National Bank; Heidi Willis, $2,200, Nova Rubber; Kristin McKay, $3,700, Dillon Cattle Company; Rachel Kesterson, $3,000, J&L Construction and Rutland Service Center; Sean Stobaugh, $2,700, Rose’s Excavating; Tiffany Tripp, $2,850, Mark Porter Chrysler, Dodge, Jeep and Ram and Reed and Baur Insurance; Elisha Jane Williams, $2,800, Leedy Angus Farms; Justin Pierce, $2,900, Campaign to Elect Michael L. Barr; Courtnee Williams, $3,000, Valley Stone Yard; Nathan Pierce, $2,600, Farmers Bank; Olivia Wood, $3,400, State Representative Jay Edwards, Peoples Bank, and Mark Porter Chrysler, Dodge, Jeep, Ram. Austin Rice (Grand Champion), $1,400, Dettwiller Lumber and Peoples Bank; Cooper Schagel (Reserve Champion), $1,000, Kinsale Corporation; Trace Erwin, $400, Bob’s Market; Levi Williams, $350, Leedy Angus Farms; Corey Seth, $600, Baum Lumber Company; Sarah Williams, $500, Michael’s Egg Farm and Ohio Valley Bank; Joseph Butcher, $425, Farmers Bank; Hannah Erwin, $500, McGinnis Inc.; Landen Woods, $450, Dr. Douglas Hunter; Lane Edwards, $500, Gavin Plant; Israel Williams, $450, Farmers Bank; Raeann Schagel, $600, Buckley Group Engineering and Surveying; Emma Doczi, $500, Farmers Bank; Dominique Butcher, $400, Home National Bank; Lilyanna Butcher, $400, A-1 Sanitation; Faith Butcher, $400, Pat Mullen Construction and RVC Architects; Hunter Smith, $450, Mama and Papa; Lydia Edwards, $800, Gavin Plant; Michael Letson, $400, Farmers Bank; Mattison Finlaw, $550, Mark Porter AutoPlex. Brycen Rowe (Grand Champion), $1,800, Ridenour Gas Service; Hanna Bottomley (Reserve Champion), $1,050, Ridenour Gas Service; Emilie Smith, $800, Holzer Health System Meigs; Rachel Jackson, $600, Bob’s Market; Brayden O’Brien, $450, Peoples Bank; Ciera Whitesell, $450, Farmers Bank; Avery Patterson, $700, Baum’s TP One Stop; Gabby Beeler, $550, Farmers Bank; Hannah Jackson, $550, Dr. Douglas Hunter; Taylor Bartrum, $500, Gavin Plant; Kendall Schagel, $700, Pool Masters of Vienna; Kadynce Wolfe, $475, K&C Show Poultry; Alexis Grubb, $600, Mark Porter Ford; Gavan Smith, $700, Gavin Plant; Sidney Dillon, $600, Baum Lumber Company; Hannah Evans, $500, Home National Bank; Matthew Jackson, $500, Matthew Jackson; Valerie Hamm, $400, AEP Mountaineer Plant; Hunter Clary, $400, Butcher Logging; Brogan Jenkins, $450, H&L Hoof Trimming; Blake Cremeans, $400, Mark Porter Chevrolet and Ohio Valley Bank; Raeven Reedy, $450, Mark Porter Ford; Samual Cremeans, $500, Gavin Plant; Keaghan Wolfe, $450, Farmers Bank; Jacob Spencer, $500, Buckley Group Engineering and Surveying; Adryauna Parker, $400, Home National Bank; Andrea Mahr, $450, Baum Lumber Company; Jackie Dailey, $450, Farmers Bank; Dana Card, $450, Ridenour Gas Service; Nathan Minshall, $500, Birchfield Funeral Home; Brayden Stanley, $500, Stanley Logging and Prosecutor James K. Stanley; Alexia Cremeans, $500, Ohio Valley Bank and Mark Porter Chrysler, Dodge, Jeep, Ram; Leah Spencer, $1,000, Drs. Jeremy and Martha Buckley. Olivia Harris — Gheen Painting, $500; Allison Hatfield — Bridgeport Equipment Tools, $1,000; Preston Ervin — Hubbard Farm and Greenhouse, $200; Owen Johnson — PDK, $250; Brayden Ervin — Aunt Shelia Carsey, $200; Samuel Bauerbach — Parker Corporation, $100; Dalton Ervin — Hubbard Farm and Greenhouse, $150; Ryan Parker — PDK, $250; Austin Rose: Tara Roberts Thirty-One Consultant, $100; Sarah Hawley, $100; Conner Ervin — Aunt Shelia Carsey, $200; Madison Johnson — PDK, $250; Cassidy Bailey: Sarah Roush, $500; Mark Porter Chevrolet, all beef feeders to $1500. Jessica Parker — Parker Corporation, $150, Grandma and Grandpa Cecil, $500; Jennifer Parker — Parker Corporation, $500, Grandma and Grandpa Cecil, $400; Heritage Co-Op, $200; Makenzie Robertson — Parker Corporation, $200, Grandma and Grandpa Cecil, $300; Bryant Mohler — Hatfield Farms, $100; Ben Bailey — Shade River Farms, $100; Sammi Mugrage Clerk of Courts, all market goats to $600. Wyatt Watson — Pool Masters of Vienna, $100; Braden Watson — Parker Corporation, $100; Lincoln Thomas — Constellium, $100; Matthew Werry — Parker Corporation, $100; Caroline Roush — Mamaw and Papaw Walker, $100; Mark Porter Chevrolet, all market lambs to $1,000. Kaylin Butcher — Reed and Baur and Birchfield Funeral Home, $100. Jacob Jordan — Holzer Health System Meigs, $100; Courtney Fitzgerald — Skyline Bowling Center, $500; Brady Colburn — PDK, $250; Brandon Oldaker — PDK, $250; Whitney Durst — Constellium, $100; Chloe Rizer — Holzer Health System Meigs, $100; Logan Caldwell — Holzer Health System Meigs, $100. Jess Parker — Parker Farms, $300, Grandma and Grandpa Cecil, $1,000; Faith Bauerbach — Parker Corporation, $500, Parker Farms, $300; Rylee Lisle — PDK, $250, Constellium, $100; Kristin McKay — JTM Contracting, $300; Olivia Wood — PDK, $250; JayMar, all beef steers to $2,500. Mattison Finlaw — Curtis Wildlife Foods, $100; Donna Yeril, $100; J&M Auto Sales, all market poultry to $500. Brycen Rowe — PDK, $100; Rachel Jackson — Constellium, $100, Fitch Farms, $50; Brayden O’Brien — Constellium, $100; Gabby Beeler — Grandma and Grandpa Beeler, $100; Taylor Bartrum — PDK, $100, Jordan Parker, $100; Sidney Dillon — JTM Contracting, $200; Hannah Jackson — Constellium, $100; Matthew Jackson — Constellium, $100; Brogan Jenkins — Arrow Smith Archery, $25; Keaghan Wolfe — Arrow Smith Archery, $25, PDK, $100; Andrea Mahr — PDK, $200; Dana Card — Pomeroy Express Care of PVH, $500, Reed and Baur and Ohio Valley Plumbing, $100; Brayden Stanley — PDK, $100. 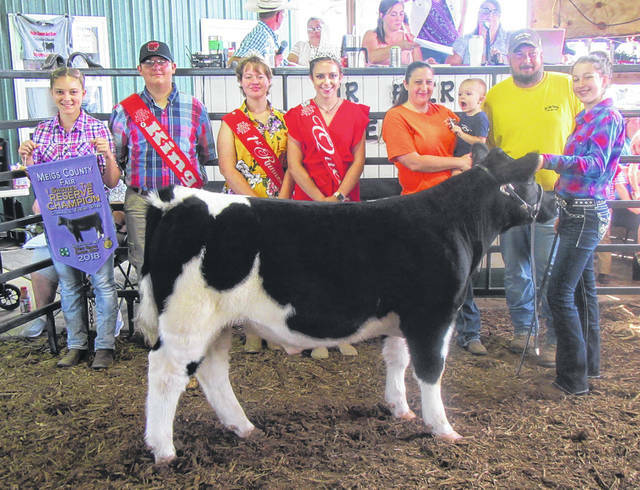 https://www.mydailysentinel.com/wp-content/uploads/sites/14/2018/08/web1_8.21-Beef-Feeder-Grand_ne201881914044423.jpgGrand Champion Beef Feeder shown by Olivia Harris; Purchased by Burke Farms. 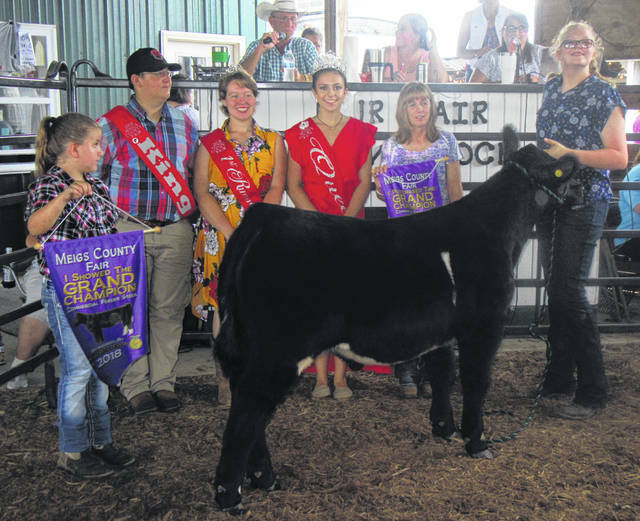 https://www.mydailysentinel.com/wp-content/uploads/sites/14/2018/08/web1_8.21-Beef-Feeder-Reserve_ne201881914047604.jpgReserve Champion Beef Feeder shown by Mackenzie Newell; Purchased by Reed and Baur Insurance and Ohio Valley Plumbing. 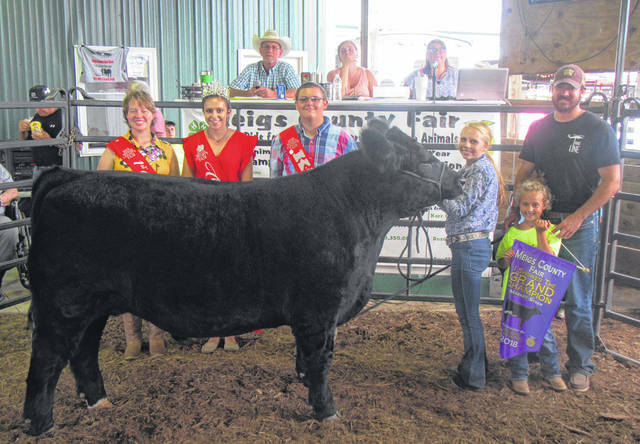 https://www.mydailysentinel.com/wp-content/uploads/sites/14/2018/08/web1_8.21-Beef-Steer-Grand_ne201881914050172.jpgGrand Champion Beef Steer shown by Jess Parker; Purchased by Parker Corporation. 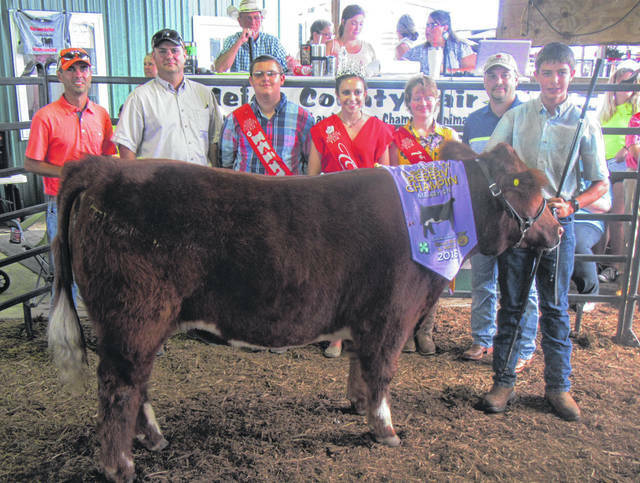 https://www.mydailysentinel.com/wp-content/uploads/sites/14/2018/08/web1_8.21-Beef-Steer-Reserve_ne201881914053279.jpgReserve Champion Beef Steer shown by Trenton Morrissey; Purchased by Drs. Jeremy and Martha Buckley, Buckley Group Engineering and Surveying and Precision Fabrication. 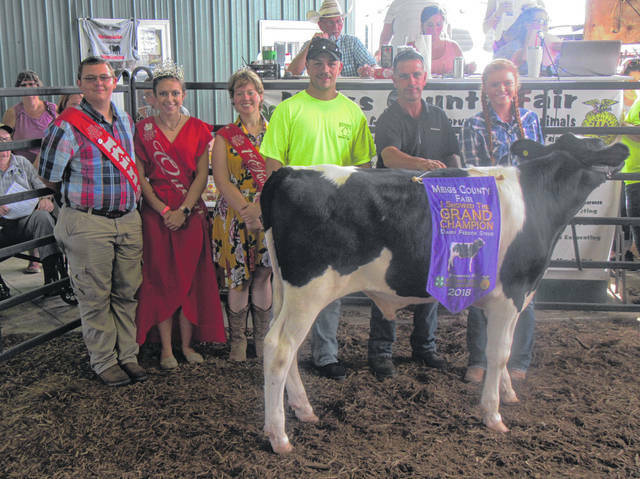 https://www.mydailysentinel.com/wp-content/uploads/sites/14/2018/08/web1_8.21-Dairy-Feeder-Grand_ne201881914055651.jpgGrand Champion Dairy Feeder shown by Allison Barber; Purchased by Hendrix Heating and Cooling and Hendrix Contracting. 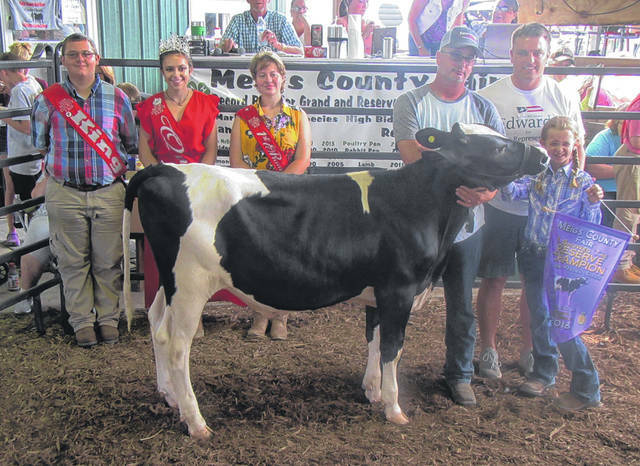 https://www.mydailysentinel.com/wp-content/uploads/sites/14/2018/08/web1_8.21-Dairy-Feeder-Reserve_ne201881914058246.jpgReserve Champion Dairy Feeder shown by Raegan Jones; Purchased by State Representative Jay Edwards. 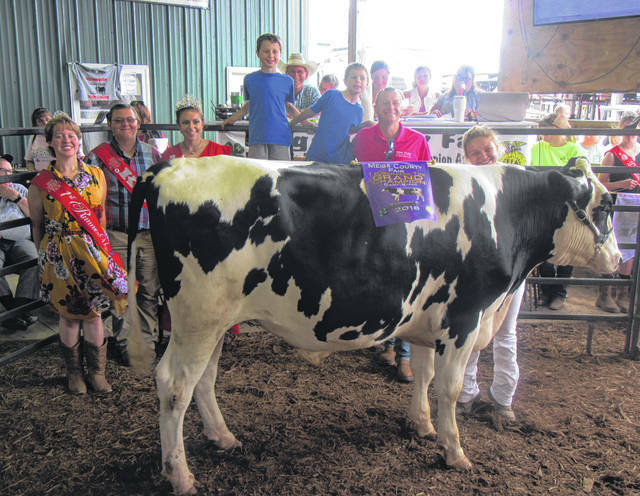 https://www.mydailysentinel.com/wp-content/uploads/sites/14/2018/08/web1_8.21-Dairy-Steer-Grand_ne20188191410623.jpgGrand Champion Dairy Steer shown by Kaylin Barber; Purchased by Mark Porter Chevrolet. 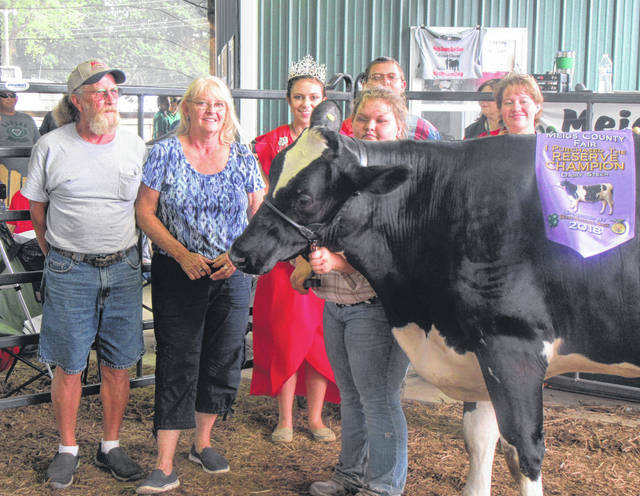 https://www.mydailysentinel.com/wp-content/uploads/sites/14/2018/08/web1_8.21-Dairy-Steer-Reserve_ne20188191413217.jpgReserve Champion Dairy Steer shown by Grace Butcher; Purchased by RVC Architects. 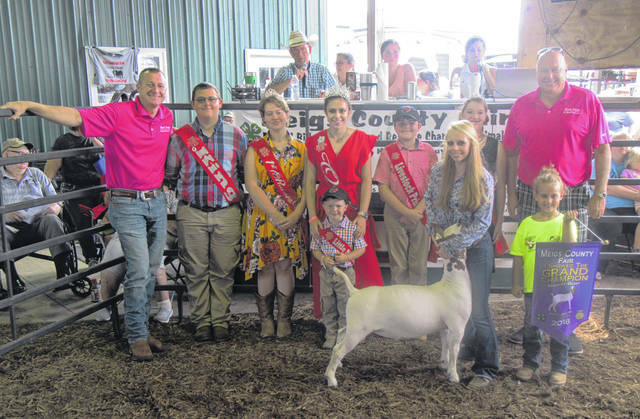 https://www.mydailysentinel.com/wp-content/uploads/sites/14/2018/08/web1_8.21-Goat-Grand_ne20188191415643.jpgGrand Champion Goat shown by Jessica Parker; Purchased by Mark Porter Chevrolet. 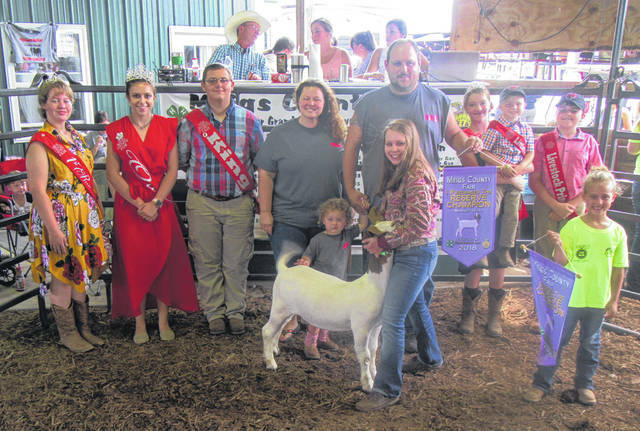 https://www.mydailysentinel.com/wp-content/uploads/sites/14/2018/08/web1_8.21-Goat-Reserve_ne2018819141840.jpgReserve Champion Goat shown by Jennifer Parker; Purchased by Parkersburg Home Surplus and Liquidation. 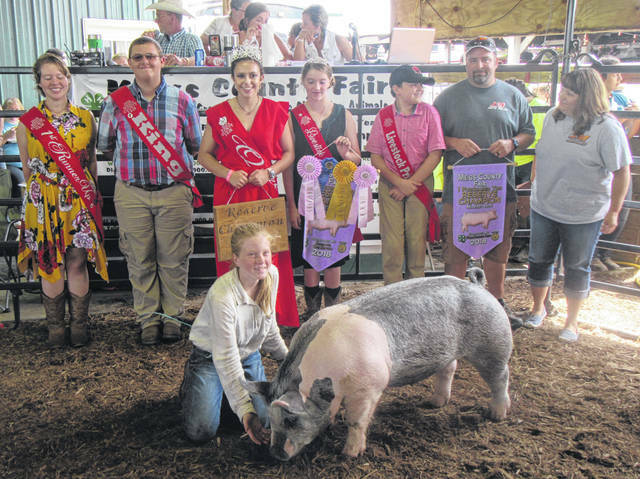 https://www.mydailysentinel.com/wp-content/uploads/sites/14/2018/08/web1_8.21-Hog-Grand_ne201881914110458.jpgGrand Champion Hog shown by Jenna Jordan; Purchased by Stanley Logging and Meigs County Prosecutor James K. Stanley. 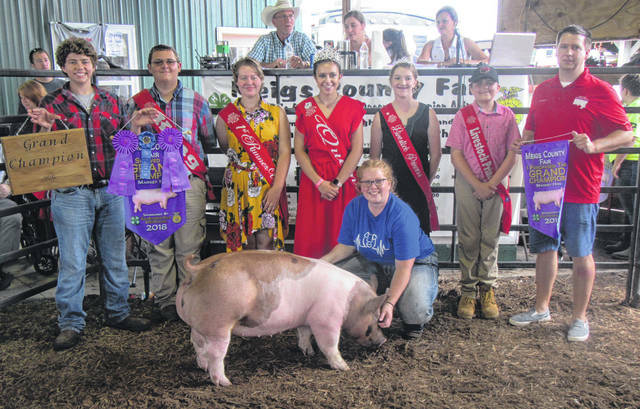 https://www.mydailysentinel.com/wp-content/uploads/sites/14/2018/08/web1_8.21-Hog-Reserve_ne2018819141135.jpgReserve Champion Hog shown by Jaycie Jordan; Purchased by J&M Auto Sales. 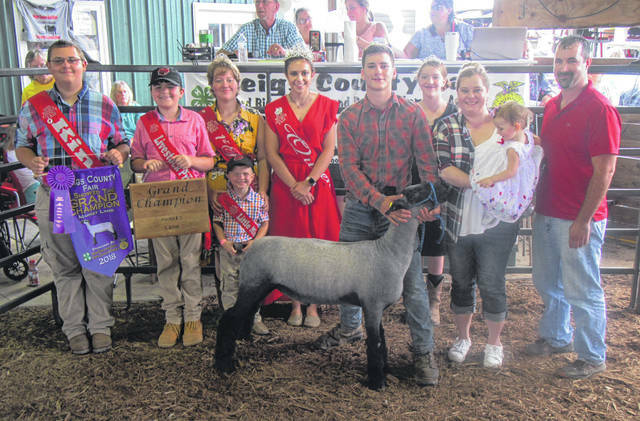 https://www.mydailysentinel.com/wp-content/uploads/sites/14/2018/08/web1_8.21-Lamb-Grand_ne201881914115355.jpgGrand Champion Lamb shown by Auston Colburn; Purchased by Dr. Meghan Haynes of Holzer Athens. 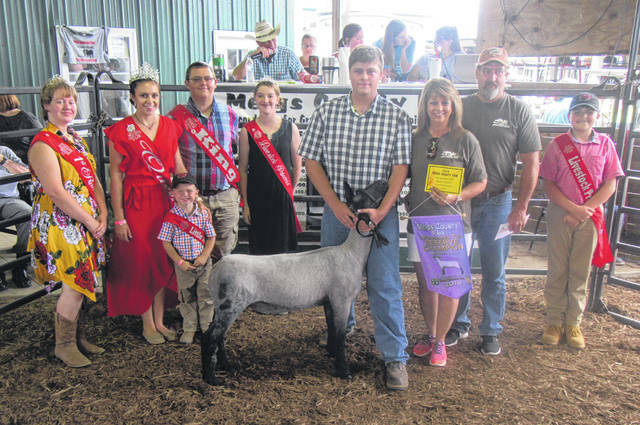 https://www.mydailysentinel.com/wp-content/uploads/sites/14/2018/08/web1_8.21-Lamb-Reserve_ne201881914117898.jpgReserve Champion Lamb shown by Wyatt Watson; Purchased by Pool Masters of Vienna. 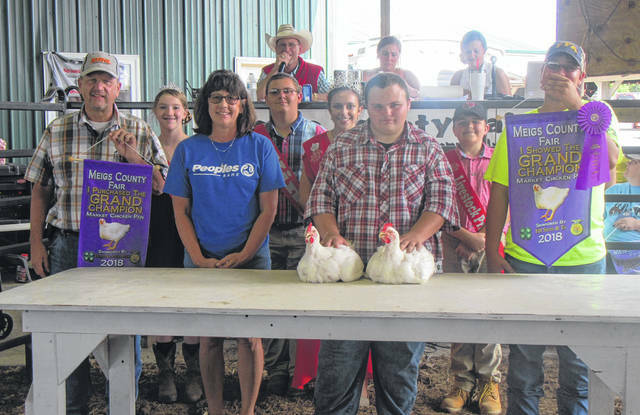 https://www.mydailysentinel.com/wp-content/uploads/sites/14/2018/08/web1_8.21-Poultry-Grand_ne201881914120416.jpgGrand Champion Poultry shown by Austin Rice; Purchased by Dettwiller Lumber and Peoples Bank. 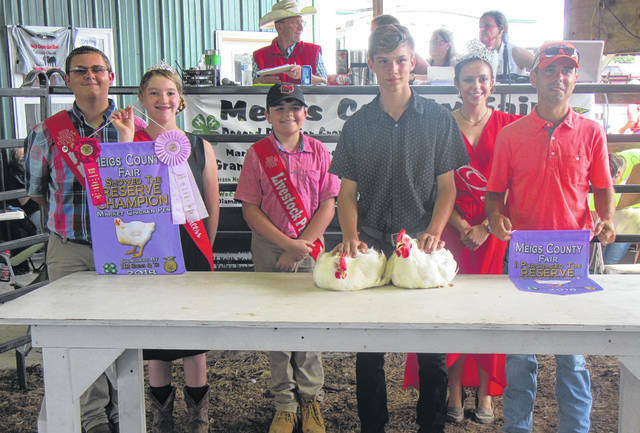 https://www.mydailysentinel.com/wp-content/uploads/sites/14/2018/08/web1_8.21-Poultry-Reserve_ne201881914122943.jpgReserve Champion Poultry shown by Cooper Schagel; Purchased by Kinsale Corporation. 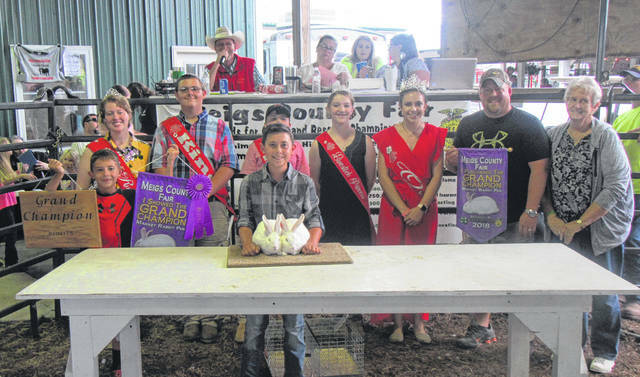 https://www.mydailysentinel.com/wp-content/uploads/sites/14/2018/08/web1_8.21-Rabbit-Grand_ne201881914125222.jpgGrand Champion Rabbit shown by Brycen Rowe; Purchased by Ridenour Gas Service. https://www.mydailysentinel.com/wp-content/uploads/sites/14/2018/08/web1_8.21-Rabbit-Reserve_ne201881914127537.jpgReserve Champion Rabbit shown by Hanna Bottomley; Purchased by Ridenour Gas Service.